Elizabeth East is bounded by Yorktown Road, a line to the south of Olive Grove Reserve, Midway Road and a line ot the south of Adam Creek in the north, an alignment running south between Chesterfield Walk and Cardnell Crescent, Blackburn Road and Shandon Court in the east and south, and Main North Road in the west. 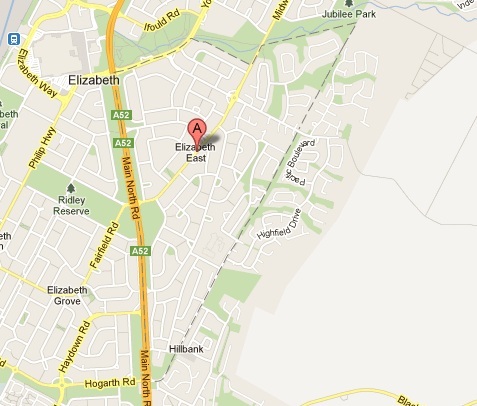 Elizabeth East is named for the area east of Elizabeth, which is names after Queen Elizabeth II. Elizabeth East is an established residential area. Major features of the area include Elizabeth East Shopping Centre, Spruance Oval, Jubilee Park and one school. The median age of people in Elizabeth East is 37 years with children between the ages of 0 and 14 making up 19.6% of the population, and people aged 65 years and over making up 19.3%. Of occupied private dwellings in Elizabeth East, 62.7% are separate houses, 22.8% are semi-detached, row or terrace houses, townhouses etc., and the suburb consists of 14.5% flats, units, apartments or other dwellings. Out of these properties, 19.4% are owned outright, 30.6% are owned with a mortgage and 44.8% are rented. 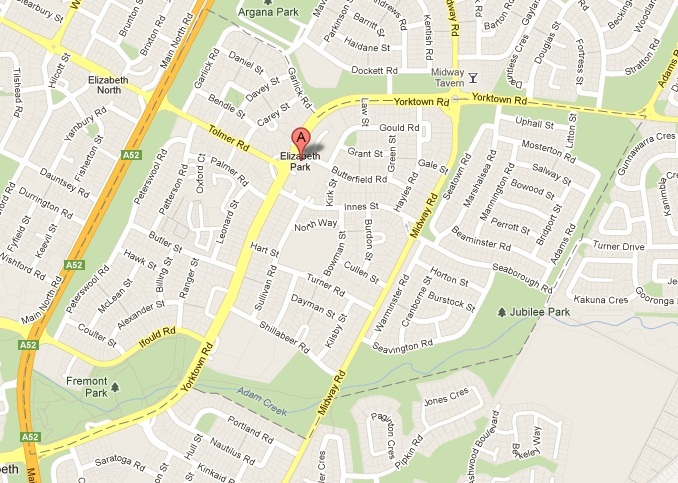 Elizabeth Park is bounded by Garlick Road and Yorktown Road in the north, the Tuner Drive alignment and a line running to the south of Adam Creek in the east, a line running to the south of Olive Grove Reserve and Yorktown Road in the south, and Main North Road in the west. Elizabeth Park is named for an area near Elizabeth, which is named after Queen Elizabeth II. Elizabeth Park is an established residential area, with a small commercial area. Major features of the area include The Parks Shopping Centre, Fremont Park, Olive Grove Reserve, Jubilee Park, Dwight Reserve and two schools. The median age of people in Elizabeth Park is 34 years with children between the ages of 0 and 14 making up 21.9% of the population, and people aged 65 years and over making up 18.2%. Of occupied private dwellings in Elizabeth Park, 78.7% are separate houses, 15.0% are semi-detached, row or terrace houses, townhouses etc., and the suburb consists of 6.3% flats, units, apartments or other dwellings. Out of these properties, 19.4% are owned outright, 30.6% are owned with a mortgage and 44.8% are rented.